We bring forth our massive industrial involvement and expertise in this business, instrumental in rendering Hot Insulation Service to our customers. This service is extensively valued by our patrons owing to its appropriate execution. Besides, we provide this service to our clients at market leading price. 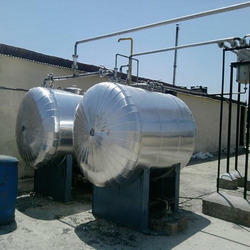 With our rich industrial experience, we hold expertise in Hot Insulation Service. The creative team of professionals is rendered these services according to the client’s requirements. Also, these offered services are rendered using latest technology by keeping in mind the prevalent trends of the industry. We are engaged in the field of carrying out Insulation Hot and cold for different types of industries including chemical, pharmaceutical, engineering and many others. Besides we use superior quality raw materials for carrying out insulation as Thermocol, PUF, Fiber Glass, R Wool & LRB. We use equipments and machinery which ensures highly effective work. Building insulation refers broadly to any object in a building used as insulation for any purpose. While the majority of insulation in buildings is for thermal purposes, the term also applies to acoustic insulation, fire insulation, and impact insulation (e.g. for vibrations caused by industrial applications). Hot Thermal Insulation used in Electrostatic Pericipator to maintain hot air in casing so that dust collect in Hopper and clean air goes up. Arcs ship team completed entire job of insulation & cladding job on MV sea cargo during her construction in recent past, which include the main engine exhaust, silencers, Generator exhaust etc. 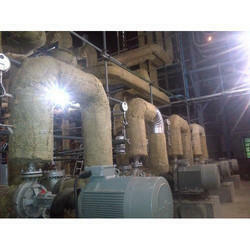 - Insulation is an important process for the longevity of various machines and equipment. We expertise in both Hot and Cold insulation for boilers, Pipes, Vessels and storage tanks of any magnitude. Our world class in-house facilities enable us to customize our insulation services as per specific requirements of our esteemed clients.